“Among various challenges of democracy in the national and global context at present, the difference in the understanding of democracy between the ruler and people is the pressing one,” said Professor Krishna Khanal during a talk program in Kathmandu on September 14. A talk program titled “Contemporary Challenges of Nepali Democracy” organized by Freedom Forum on the occasion of the International Day of Democracy, Prof Khanal delivered a lecture on universal values of human rights, its dimensions, and major challenges. As he said, the universal values of democracies are free press, independent judiciary, rule of law, free and fair election, accountable government, while the structure, process and institution to nurture democracy may be different. However, the conventional lens of democracy does to fulfill citizens needs, broader thoughts and liberal practices are must, he underscored. Prof Khanal laid the emphasis that democracy is a process and platform for utmost exercise of people’s rights. Unlike guided system, democracy is always in evolution where consensus, collaboration and cooperation are kept intact. “Democracy has become trading resulting in degradation of human values and individuals have been treated as commodity in the contemporary Nepal, which is a severe blow to the system,” he warned. Anyone, as he said, can disagree with constitution. Giving reference of Switzerland, right to dissent is practiced there despite not having opposition in the government. Similarly, South Africa has presidential parliamentary system. If the new actors of democracy are not recognized, the system does not serve the people. Internal dispute is another threat to democracy. So, government needs to work considering its limitation in democracy. In Nepal and in the globe, democracy is getting vulnerable, he pointed further warning that present government was likely to become ultra rightist thereby curtailing democratic rights of the citizens. He flatly rejected the concept that Nepali communists are real communists. Responding to a question, lokatantra was just the rebranding of the term ‘democracy’. “Civic space is shrinking in Nepal. Nepal has got most arrogant leadership in the country’s history. Politics of negation is growing. Geostrategic management must be effective to keep Nepal free from foreign meddling,” he added. Similarly, in response to the query whether political parties had lost relevance, Prof Khanal said although political parties have no alternative, their relevance is weakening day by day. Every political party needs to prove its relevance and importance, he underscored. Moreover, the key note speaker pointed out the need that the system recognize the new actors such as regional parties and ethnic groups are coming to the fore; identity based politics came bringing challenges to the established structure and style, he viewed. According to him, political parties are the need-based vehicles and platforms but the destination is important. When values are transformed into systems it may be a serious thing sometimes. Individual is at the receiving end. 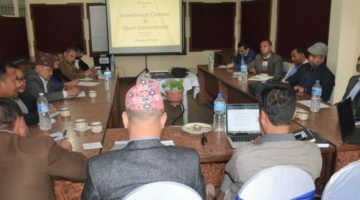 Initiating the program, FF Chief Executive Taranath Dahal said the discussion on democracy had been a pertinent agenda for civil society, political parties and every aware Nepali citizen at present, coinciding with the International Day of Democracy. From policy and laws to the political practices, the suppressive behaviours must be negated to protect democratic values that are hard earned in the country. So, the lecture by Prof Khanal could be an enlightening to the participants from diverse sectors. Time has come for everyone to frustrate challenges of democracy from their respective sides. FF Chairman Hari Binod Adhikari expressed gratitude to Prof Khanal for sharing his knowledge on the challenges of democracy in national and international arena along with his experience of making aware the Nepali politicians on protecting democratic values from time to time. The participants including Freedom Forum Chairman Adhikari, Chief Executive Dahal, General Secretary Dharmendra Jha, journalists Krishna Sapkota and Narayan Ghimire, advocates Baburam Aryal and Sanjiv Ghimire, leader Mohan Baral, Chairman of Minimum Wage Fixation Committee, Gangadhar Parajuli put forth queries to Prof Khanal and made complementary remarks on different aspects of democracy. Freedom Forum has been celebrating the International Day of Democracy for four years in Nepal.